Belmont House is an elegant 18th century Grade II listed property which has been only recently renovated. Period features like the stone floors and fireplaces remain, but the house has been brought perfectly up-to-date. The ground floor rooms have high ceilings and large sash windows to make the most of the far-reaching views. The kitchen/breakfast room also has lots of space, while an additional kitchen allows for catering large events. Upstairs the master bedroom suite is very comfortable, and there are five further bedrooms (three en-suite) on the first floor; the second floor offers a further bedroom, shower room and sitting room. The cellars are accessed from the main staircase and run beneath the library, entrance hall and drawing room, and a former racquets court has already had lapsed planning consent for an indoor swimming pool. Accommodation in total comprises: entrance hall, drawing room, library, dining room, sitting room, kitchen/breakfast room, second kitchen, and upstairs the master bedroom suite and seven further bedrooms, and five further bathrooms. Outside, a fountain provides a picturesque focal point and to the side and rear of the house are wide sweeping lawns dotted with a variety of specimen trees. Beyond the formal gardens the land comprises a mixture of mature woodland and a large paddock. Planning permission has also been granted for ten stables and a tack room. The grounds come to around 20 acres. 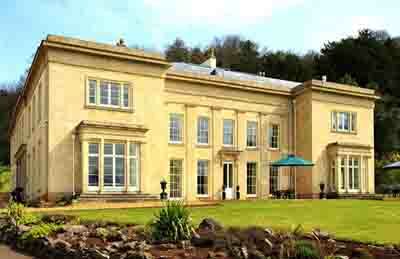 Belmont House lies around four miles west of Bristol and also has great access to Bath. The guide price is £2,750,000. For further information please contact Knight Frank on 0117 317 1999 or visit www.knightfrank.co.uk.